Bhubaneswar: As a part of its expansion plans, Manya –The Princeton Review, a renowned premium service player in overseas education, launches its 47th centre at Bhubaneswar. Emerging as an educational hub with scores of reputed colleges & research institutes, Bhubaneswar has been on the list of preferred cities for building the Manya brand. Aspirants looking to study abroad will now get an opportunity to be trained by Princeton Review certified trainers& advisors who go through a rigorous training program. 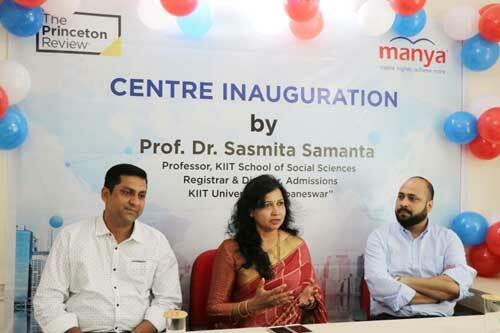 The centre was inaugurated by proff Dr. Sasmita Samanta who is extremely happy that a player of Global reputes is now in bhubaneswar to cater to the needs and aspirations of students who want to pursue their education abroad. With 15 years of experience in enabling students to fulfil their study abroad aspirations, Manya -The Princeton Review, holds the distinction of having served over 2 Lac aspirants. Manya’s mission of ‘Aspire Higher, Achieve More’ has translated into several of their students leading the scoring parade in qualifying tests such as GRE, GMAT, SAT, ACT, TOEFL, IELTS etc. and getting admits from top universities such as Harvard University, Carnegie Melon University, Georgia Tech University, Urbana Champaign, Columbia University, UT Austin, University of Michigan and many more. Manya services over 45,000 students annually and is proud to partner with over 600+ highly reputed academic institutions across the country. Manya-The Princeton Review guides students through the entire journey starting from test preparation, short-listing of schools, developing a competitive application strategy, interview prep and visa services. The strength of the organization is its innovative value proposition to the students in terms of focused techniques and tools for test prep, empathy with the student on their individual learning needs, customized admissions strategies and most importantly a collective effort to help the student realize their dreams.